Drop Dead Diva: cancelled; no season five? Lifetime has decided to cancel Drop Dead Diva after four seasons on the air. 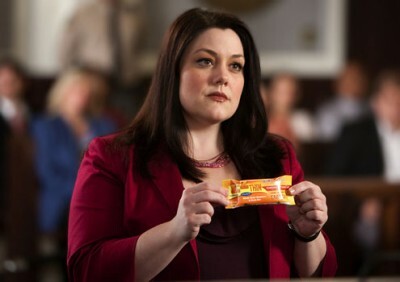 Debuting in July 2009, Drop Dead Diva begins as a vapid aspiring model named Deb is killed in a car accident. Unhappy with her prospects in heaven, she finds herself sent back to Earth and ends up in the body of a recently deceased lawyer, Jane (Brooke Elliott). Deb must now deal with being in the body of her complete opposite –someone who’s brilliant, hard-working, charitable, and overweight. Others in the cast have included Margaret Cho, April Bowlby, Kate Levering, Jackson Hurst, Josh Stamberg, Ben Feldman, Lex Medlin, and Carter MacIntyre. The fourth season finished airing on September 9th and averaged 2.3 million viewers with a 0.8 rating in the 18-49 demographic. That was slighly better than the performance of the third season — 2.26 million with a 0.7 in the demo. The cable channel reportedly tried to get a boost in the ratings this season by adding Kim Kardashian in a recurring role but that move obvioulsy didn’t have much of an impact. Lifetime was supposedly holding off on making a decision on Diva’s future until they saw some of their current pilots. One can assume that, since they’ve cancelled Drop Dead Diva, they liked what they saw. Word is that Sony Pictures TV may try to find another home for the series. Josh Berman created the show and FOX recently cancelled his other program, The Mob Doctor. What do you think? Are you sorry that Drop Dead Diva has been cancelled? Would you watch it on another station? Loved this show. It was a breath of fresh air compared to half the stuff they air on tv today. I would definitely watch this show, and Army Wives, if it was on another station. Absolutely bring back Diva, let me know where! I had a big void in Sunday night viewimg, Diva & Army Wives. Please, Please bring her back!!!! Please bring this show back! I love it and look forward to each season that it airs. It is very good and I love the people that play in it. They are great. Bring it back, I will watch on what ever station it’s on. its refreshing to finally watch funny, sweet and kindness on tv. we get enough violence just by watching the news. PLEASE bring it back…anywhere…I will watch wherever it lands! !